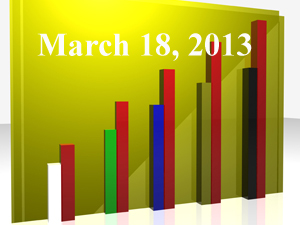 “The Ten “Don’t”s of 401k Investing,” (FiduciaryNews.com, March 12, 2013). You don’t have to part the Red Sea or ascend Mount Sinai to find these goodies! When the political class thinks it can best decide how to reform the world, stop the world and get off. Since you really can’t do that, we’ll just settle for a hopelessly divided government, at least until the next election. “SEC Charges Illinois With Pension Funding Fraud,” (AdvisorOne, March 11, 2013) Big news if you happen to hold a municipal bond from the State of Illinois. And it all has to do with its pension mess. This might be significant if people still had confidence in municipal bonds from the State of Illinois. “Kill Your 401k, Conservative Author Says,” (AdvisorOne, March 14, 2013) Yes, but if you read the article, you’ll discover this is only in response to a liberal author’s recommendation to fatten social security checks by taxes the living daylights out of retirement plans. The “conservative” author countered that threat with the advice to take your money out of your 401k before the government takes it out for you. If you think this kind of government action is far-fetched, it recently happened in several Latin American countries, include Pope Francis’ homeland of Argentina. “Senators protest IBM’s 401k changes,” (MarketWatch, March 14, 2013) Nothing IBM did was illegal. Truth be told, nearly one out of every ten companies offering a 401k plan do what IBM will be doing. So, what prompted two U.S. Senators to think they have a right to interfere with the internal HR policy of a private, albeit publicly traded, company? Here’s a hint: Take a look at the pedigree of the Senators. The question is: Is this a borderline ethics or tampering violation, especially since this is a publicly traded company? “Why Social Security Is the Best Retirement Saving Vehicle,” (Bloomberg, March 14, 2013) A valiant, if strained, effort to deny to the reality of the public pension plan morass by calling something “Social Security” that is in reality not what most people know as “Social Security.” As usual, the author ignores the tremendous success 401k plans have been for folks responsible enough and disciplined enough to save modestly. While the professional fiduciaries (the plan service providers) continue to glide down the path of idle threats, the accidental fiduciaries (plan sponsors and their executives) have discovered new ways in which their personal fiduciary liability has increased. “Mary Jo White to Focus on Fiduciary Issue at SEC,” (AdvisorOne, March 11, 2013) Well, what she says is all very well and good. What she actually does is where the rubber meets the road. “Red alert for fiduciaries on plan financial reports,” (Employee Benefit Adviser, March 13, 2013) Oh, the tangled web regulators weave. In the process of trying to catch actual thieves, they have created a confusing and burdensome reporting system that creates common criminals from the most innocent of corporate workers. This is a must read for all plan sponsors. This is the sound of crickets chirping. Seriously? These are top stories this week? No wonder most average folk think investment advisers are nothing more than mere snake-oil salesmen. Even the academics can’t steer away from the allure of being the de jour guru on the mountaintop. It’s enough to make one pack up the family and head for the Hills. The Black Hills. South Dakota way. In one of them thar abandoned mines… But, then again, doing so would only mean “they” win, and a good fiduciary would never do anything that would let “them” win. “Target date funds beat ‘superior’ DB plan portfolios,” (Employee Benefit Adviser, March 15, 2013) But only because the specific target date fund they looked at had higher equity percentages; ergo, there’s nothing to see here. Move along. “Alicia Munnell: Ban Actively Managed Funds From 401k Plans, IRAs,” (AdvisorOne, March 15, 2013) Before you get too critical of Munnell, rest assured, her heart is in the right place. She’s just mixing her metaphors, so to speak. What she’s really railing against is the conflict-of-interest problem caused by service providers selling proprietary funds. This is a worthy cause. For some unknown reason (probably little to no actual field experience), she introduces the active vs. passive debate into her fiduciary diatribe, which both hurts her personal credibility and her otherwise strong fiduciary argument. Doesn’t she realize, for example, bundled service providers sell high-price affiliated index funds alongside their high-price affiliated actively managed funds. The investment style has nothing to do with the conflict-of-interest issue. Besides, if you banned actively managed funds from retirement plans, there’d have been an awful lot of investors sitting on no returns during the “lost decade,” when, according to Lipper data, the average actively managed funds beat index funds by significant margins. If this real world data doesn’t convince you, read this article to get the academic reasons why, in fact, index investing should be outlawed.